This study examines the utility of nonlinear dynamic concepts for analysis of rainfall variability across Western Australia. The correlation dimension method, which involves data reconstruction and nearest neighbor concepts, is employed to estimate the dimensionality of rainfall time series and assess the degree of variability (or complexity) of rainfall dynamics. Monthly rainfall data observed over a period of 67 years (January 1937–December 2003) from each of 62 raingage stations across Western Australia are analyzed. The results indicate the utility of the dimensionality concept for identification of rainfall variability at point locations and rainfall patterns across space. The dimension estimates (ranging from 4.63 to 8.29) suggest a medium-level complexity in rainfall dynamics at each of the 62 stations and, hence, across Western Australia. Rainfall dynamics are generally more complex in the southwest part of Western Australia than in other parts of the state, with the far south exhibiting a greater complexity. Also, the mid-western region exhibits slightly more complex rainfall dynamics when compared to the northeast. The reliability of the correlation dimension estimates with respect to data size (i.e. number of data points in time series) is also discussed. 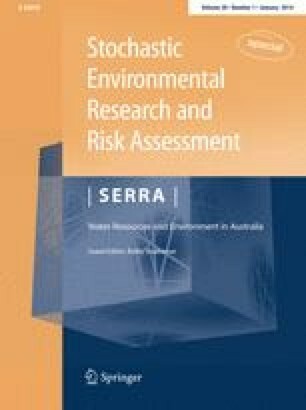 The outcomes of the present study, the first ever based on nonlinear dynamic and chaos theories for rainfall in Australia and also across a far more extensive network of raingages, can provide new avenues for rainfall (and other hydrologic) studies in Australia and for spatial/spatio-temporal analysis. This study is supported by the Australian Research Council (ARC). Bellie Sivakumar acknowledges the financial support from ARC through the Future Fellowship grant (FT110100328).